After YouTube faced major backlash to its ad placements system - which, in some cases, saw brand content placed alongside offensive videos, creating negative association - all digital platforms have been working to provide additional tools and assurance measures to help advertisers ensure that their content does not appear in unwanted areas or contexts. Facebook is the latest to update its ad tools along this line - following on from updates to its Block Lists and Transparency Controls, Facebook has now added an Inventory Filter, which will enable advertisers to choose a level of protection they want to apply to their ad placements. Standard inventory provides moderate protection and is the default choice when placing ads. This is the same as no category exclusions today. Full inventory selects minimal protection and ads may be delivered to all eligible content. 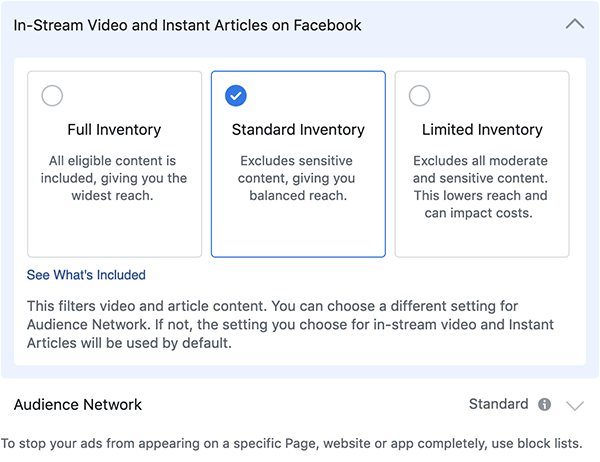 The option will give advertisers another way to ensure brand safety for ad placements, and will apply to all ads delivered across Instant Articles, Audience Network and Facebook in-stream video. Up till now, advertisers have been able to specifically choose where their ads are shown, or not shown, in each category, but this will provide a more generalized option, as opposed to advertisers having to specify publishers or content types alongside which they do not want their ads to appear. As noted, the YouTube placement controversy brought the issue to a head back in 2017, when several major advertisers threatened to pull their ad spend due to problematic associations for them and their clients. Given the potential significance of the issue, and the impact it could have on their business, it makes sense for Facebook to offer more options on this front, and these additions will no doubt be welcomed by brands looking to better control where their ad content appears. You can read more about the new system on the Facebook Business site.